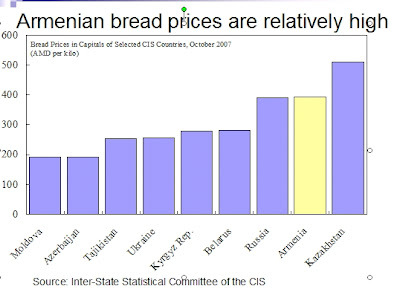 Dr. Oomes discussed what is happening to prices in Armenia, and offered a very comprehensive analysis. For a quick overview over the event, click here. Her PowerPoint presentation, which sets out her argument in good detail and includes four recommendations (more effective inflation targeting, facilitating reduction of import prices, tightening fiscal policy, and increasing the public's knowledge of inflation targeting), is available. Curious? The full presentation, with 38 slides, is right here.